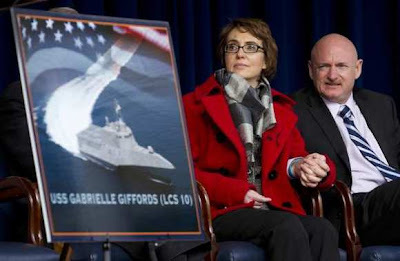 On Friday, the U.S. Navy announced that it was naming its newest combat ship after former Congresswoman Gabrielle Giffords, who recently resigned from Congress in order to fully recover from the January 8, 2011 shooting, in the head, that she suffered at the hands of Jared Lee Loughner at a political event near a Safeway in Tucson, AZ. 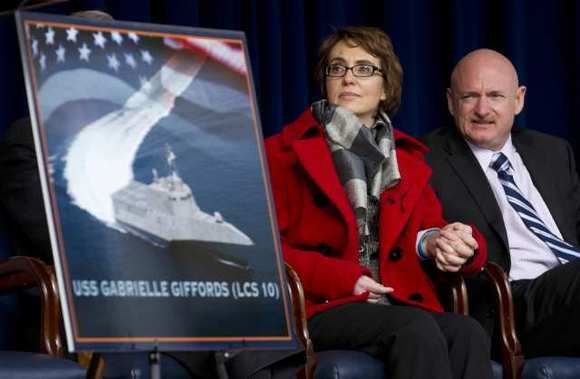 Giffords attended the Pentagon event along with Roxanna Green, the mother of Christina Taylor Green, a 9-year-old girl who was slain in the same Tucson shooting rampage that left Giffords gravely injured. Christina Green was attending the event with a neighbor when she was shot. She was born on Sept. 11, 2001, and had been featured in a book about children from the United States born on that day. Sales of that book, "Faces of Hope," soared after her death. The 3,000-ton ship, known as an Independence Variant Littoral will be built in Mobile, Ala., by Austal shipbuilding. Based on that designation, it is an Independence-class ship, of the littoral type. 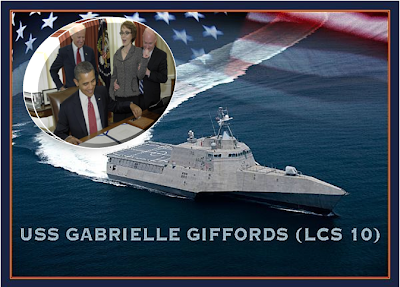 Littoral combat ships are built to patrol the littoral zone (close to shore). The U.S.S. Gabrielle Giffords will be the fifth Independence variant littoral combat ship made. Navy Secretary Ray Mabus made the announcement. The event was held at the Pentagon’s Center Courtyard, where Mabus said, "It's a major part of the future of our Navy. She's going to provide our Navy and country with fast and flexible capability ... this ship can perform an amazing variety of missions." The vessel will measure 419 feet in length and can travel in excess of 40 knots. The ships are designed with a trimaran hull. At the same time, Mabus named Roxanna Green as the sponsor of the new ship, which will be in service for three decades once completed. These littoral warships are part of the Navy’s strategy to provide access and dominance in coastal waters. The first ship of this type, the U.S.S. Independence was laid down at the Austal USA shipyard onJanuary 19, 2006. The planned second ship was cancelled in November 2007, but reordered in May 2009, and laid down in December of that year as U.S.S. Coronado, shortly before the Independence was launched. Earlier on Friday, Giffords was at the White House as U.S. President Barack Obama signed into law a piece of legislation that Giffords authored which will increase the legal penalties for those who might use ultralight aircraft while smuggling drugs into the United States. In a statement released by the White House, Obama said that "I'm confident that, while this legislation may have been her last act as a congresswoman, it will not be her last act of public service."